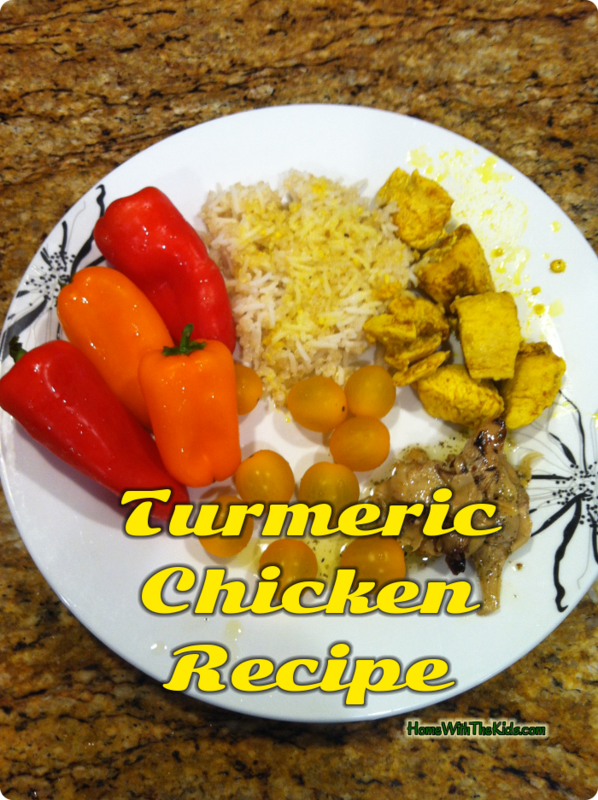 Turmeric chicken is a very popular meal in our house. My youngest, who swears up and down that she hates all spicy food, calls turmeric chicken one of her favorite meals. Admittedly, I don’t put a lot of the red chilies in there, but the flavor is there. I’m not going to point that out to her. That my picky youngest likes this goes well with my husband’s theory on kids and yellow foods. He says kids just like yellow foods. He counts carrots as yellow. Unless you’re buying yellow carrots, they’re usually orange when I look at them. But it’s not worth the argument. Too minor. I like making turmeric chicken when I don’t want to spend a lot of time on dinner. Chopping the onion and the chicken can take a while, but it’s not that bad. Start cooking the onion and garlic in the oil. Add the chicken. Then you throw the turmeric and other spices. Stir to coat the chicken completely with turmeric. Cook until the chicken is lightly cooked on the outside, but not cooked through. Add water, cover and bring to a boil. Lower to a simmer and cook for 15-20 minutes or until chicken is cooked through. This goes very well with rice. The leftover water in the pan goes well with rice. I usually simmer the water down a little to evaporate the excess water before adding to rice. Be warned that turmeric stains. Get too much on your hands, and it’s hard to get all of it off. It can also be difficult to scrub off your countertops, floor, sink… trust my experience on that one. If any turmeric gets spilled, clean it up promptly. Try hard to keep it off your clothes. I served this one with rice, tomatoes and bell peppers. The mess off to the side is a pile of grilled, marinated artichoke hearts. I found the bottles at my local 99 Only store, and they are soooo good! I bought probably too many bottles (over a dozen!) but at a dollar per, I figured it was reasonable. The hard part is not going through them too fast, because I want to figure out some recipes with them. They’re good on their own, though. Turn stove burner to medium. Heat oil in large frying pan and fry onion, garlic, and red chilies until onion turns clear. Add chicken, turmeric, salt, and pepper and stir to coat chicken thoroughly with turmeric. Cook until golden all over. Add water, cover and bring to a boil. Turn the stove to low, and simmer until chicken is cooked through. Uncover and continue to simmer to evaporate excess liquid. Combine barbeque sauce and juice from pineapple chunks in a bowl. Place chicken in slow cooker. Pour sauce over it. Cook on low for 6-8 hours, adding pineapple and bell pepper late in the cooking. I always recommend adding fruits and vegetables late in the cooking with a slow cooker if you like them a little crunchy. Add them early on and they tend to lack flavor. Coat chicken with pesto then cover with bread crumbs. Place in baking pan and bake uncovered until chicken is no longer pink, about 35-45 minutes. Preheat oven to 400F. Coat a baking dish with cooking spray. Combine seasoning and flour in a large mixing bowl. Lightly coat chicken with cooking spray, then dip and coat each breast with flour mixture. Place chicken in prepared dish and bake until cooked through, about 20 minutes. In a small bowl, combine scallions, lemon juice, curry powder, dressing, avocado, tomatoes and olives. Divide chicken breasts between four plates and top with avocado salsa. Mix honey, vinegar, rosemary, and oil. Place chicken in resealable plastic bag. Pour in mixture. Seal and turn the bag over to coat the chicken. Refrigerate for at least two hours. Place chicken in 9×13 baking pan. Sprinkle with salt and pepper. Bake for about one hour, basting occasionally with marinade. Place potatoes in a large pot of boiling water over high heat; cook until tender when pierced with a fork – about 20 minutes. Using a slotted spoon or strainer, remove potatoes from water and set aside but maintain waters boil. Add green beans to boiling water and blanch until tenderly crisp – about 1 1/2 to 2 minutes; using a colander drain over sink. Slice cooled chicken into bite-size chunks and place in a large serving bowl. Slice potatoes into 1-inch chunks and cut green beans into 1-inch pieces; gently toss with chicken. Add celery and grapes. To prepare the dressing: in a small bowl, whisk lemon juice, broth and mustard; whisk in tarragon, salt and pepper. Drizzle in oil in a slow stream, whisking all the while, until dressing turns creamy, about 1 minute. Toss salad with dressing, taking care not to break up potatoes. If desired, cover and refrigerate for up to 2 days. Heat olive oil in a large skillet over medium-high heat. Add marinated chicken and saute until cooked through, stirring frequently, about 3 to 5 minutes. Transfer chicken to a serving plate, cover with foil and transfer to oven to keep warm. In same skillet over medium-high heat, saute frozen vegetables until tender-crisp, about 3 minutes. Serve chicken and vegetables with warm tortillas, sour cream and salsa. * You can purchase chicken already marinated with fajita seasoning or use the quick and easy recipe below. Cut boneless, skinless chicken breast or thighs into strips. In a large mixing bowl, pour 2 tablespoons of Worcestershire sauce, 2 tsp. Mrs. Dash Extra Spicy Seasoning, 2 tsp. garlic powder and 1 tsp. black pepper. Coat chicken strips in sauce until completely covered; place in plastic storage baggie; pour leftover sauce in baggie and refrigerate for at least 4 hours. Mix bread crumbs, Parmesan cheese and garlic. Coat chicken breasts with bread crumbs. Place in lightly greased baking dish. Bake about 30 minutes or until chicken is done. Note: I like to cut the chicken into smaller pieces and make chicken nuggets. They freeze well for quick lunches and my kids love them. Add mushrooms, onion, celery and garlic in a large skillet coated with cooking spray and saute until vegetables are tender-about 5 minutes. Place vegetables in slow cooker and add chicken. In a cup, stir together flour and chicken broth until smooth. Add to slow cooker. Add the seasonings, crushed tomatoes and raisins, and stir in. Cover and cook on low for 5 hours. To serve, spoon 1/2 cup rice onto each of 4 plates. Top each with chicken and sauce and serve.